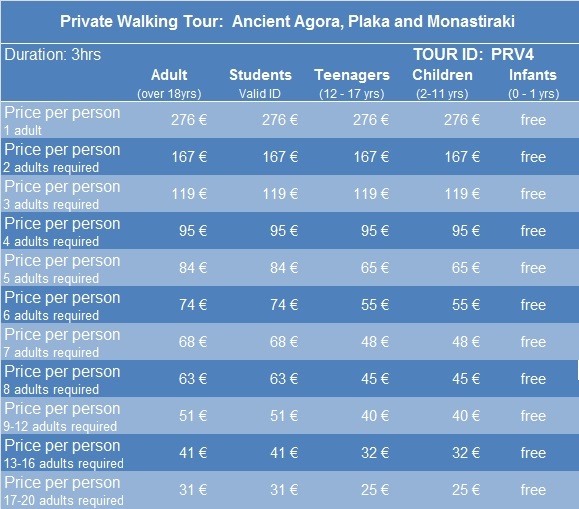 Meet with your expert licensed private guide in the heart of Athens, Syntagma square and start your tour from there. Walking along Mitropoleos Str. you will arrive to the Metropolis Athens Cathedral and to the namesake square, which marks the borders to the Old Town of Athens, the Plaka. Follow your experienced guide through Plaka’s alleys, to discover its treasures one by one: The Roman Forum, the Tower of the Winds, the Metresse, the Hadrian’s Library and Tzistarakis Mosque. Continue to Monastiraki Square and from there on, to the busy and colourful Flea Market and Avyssinias square with the antique dealers. At the Ancient Agora, your guide with their narrations, will bring to life the Market place, where ancient Greeks used to do their trades, but also used to gather to discuss city matters, thus, creating the idea of Democracy. See and capture with your camera the South Stoa, the Tholos, the Monument of the Eponymous Heroes, the Altar of the Twelve Gods, the Temple of Hephaestus and many more. 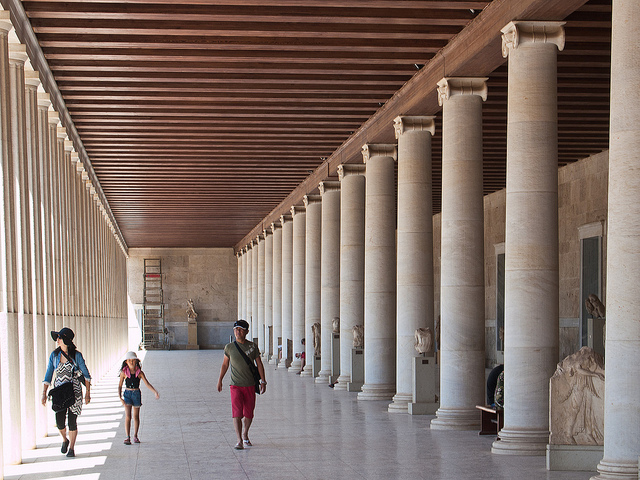 Visit the beautiful Agora Museum, housed in the Attalos Stoa and see a rich selection of artifacts used in the daily life of the Athenians. After conclusion of the visit, your guide will depart, leaving you to enjoy and further explore the site and the old part of the city. Please note that this itinerary is recommended by us, however all private tours can be customized according to your needs and preferences. Feel free to contact us for more information. Our recommendation is: Inside the Syntagma Metro Station, because we believe it is the right and most convenient spot for the route of the tour! The meeting point is next to the ticket validating machines, underneath the hanging clock. Your tour guide or office representative will be holding the orange colored Athens Walking Tours sign to identify them. Ask us for pick up from your hotel! Some, but not all hotels are conveniently located within the route of the tour and in this case, our guide will gladly meet you at your hotel lobby and start your tour from there. Please make sure you have cash (euros) with you to purchase the tickets. We buy the tickets for you in advance, in order to avoid lining up. € 4 for students outside the EU (with current student ID). For combined tickets and more information, please check here. If you are a student or teenager hold your ID, Pass or student card to show it to our office representative and also to be entitled to the reduced entrance fees. Confirmation will be received at time of booking, unless booked within 2 days of travel. In this case confirmation will be received within 48 hours, subject to availability. During winter (November 1 to March 31) the latest starting time for tours will be 11:30 am due to earlier closing times of the archaeological sites and museums. You can present either a printed paper or an electronic voucher for this tour.